How does this build perform in patch 3.5 compared to 3.4? The short answer: no differently. None of the core items for either version of this build nor any core skills were changed significantly enough to impact the build too much, if at all. On top of this, many other popular bow builds were nerfed drastically with the changes to Quill Rain and Chin Sol, however, Hopeshredder has not been touched and remains a top tier bow in my eyes. If there's a question you have please see if there's an answer here for you first, if not I'll reply as soon as I can in this thread. Q: How should I prioritize gear upgrades? A: 6l Hopeshredder -> Kaom's Heart -> Might of the Meek jewels -> Yoke of Suffering -> 2socket Tombfist. Past that is personal preferance. Q: How do you deal with the reflect clone from Atziri/Uber Atziri? A: Swap out Mirage Archer/Ice Bite (depending on which version of the build you are playing) for Slower Projectiles in your Scourge Arrow setup and always position yourself near the clone on the opposite side of the mirror, then fire Scourge Arrow away from the mirror and the thorn pods will not reach far enough to hit the reflect. Q: Your PoB shows that you don't have enough Intelligence to use Wrath, so how are you using it? A: I have it from a ring corruption, which allows me to bypass attribute requirements. If you don't have this ring corruption you can use it in a gem at a lower level. Q: What do you use to level? A: Storm Cloud/The Tempest with an RoA setup. For gems use generic flat damage like Added Cold and Added Lightning with Mirage Archer then more generic damage gems like Concentrated effect, Elemental Damage with Attacks, and Increased Crit. Q: Why do you use Increased Critical Strikes even though it isn't the highest DPS link? A: I do this for damage consistency, without Increased Crit your DPS will fluctuate a lot due to this build being a heavy crit one. 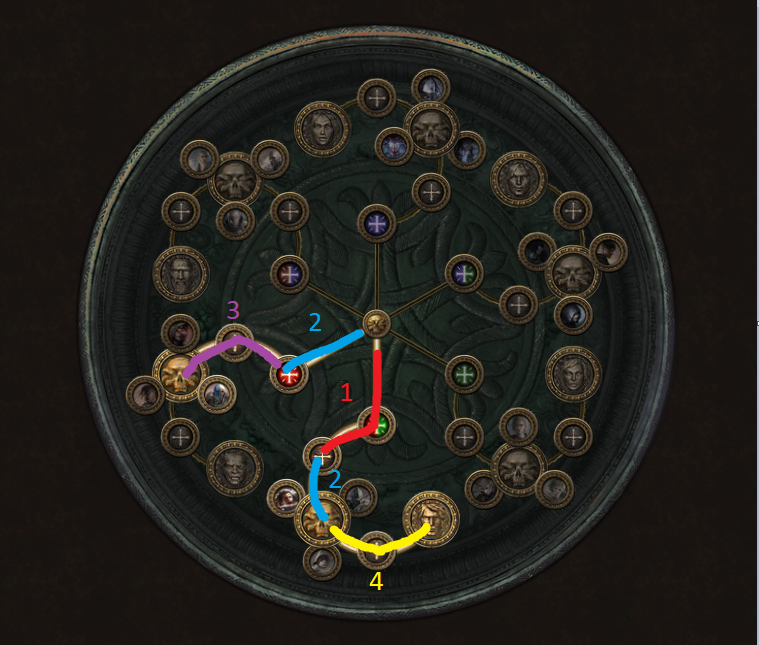 Welcome to my first ever Path of Exile build guide, the reason I wanted to share this build is simply because of how effective it turned out to be at, well basically everything. When I really got this build going I was surprised at how easily it smashed all content and farmed endgame bosses, all while being safe and fairly tanky. Since I had a few people ask me about the build in-game I decided hey why not just make a guide, so here we are. What is this build capable of? In its current state, my character has no problems smashing the most deadly T16 maps, all endgame bosses including Uber Atziri and Uber Elder while even being a fast mapper, safe delver and a great Uber Lab runner. On top of all that, this build is extremely safe for both mapping and bossing due to its long range freezes, decent life, dodge and massive amounts of overleech. The only content this build currently can't deal with is Hall of Grandmasters. For this build we will be stacking flat elemental damage and using Hopeshredder, which is a very unique bow that adds flat cold damage while granting you many bonuses such as leech, damage and movement speed per Frenzy Charge, but with the added downside that you take a nasty cold damage degen while moving, in order to counter this and utilize the bow properly, I decided to play as a Slayer/Raider Ascendant in order to counter the degen and maintain Frenzy Charges against bosses. As our main skill we use Scourge Arrow, a new skill introduced in 3.4 that's quickly become one of my all-time favorites, and I believe it's currently very underrated. As a quick summary of how it works for those unfamiliar, Scourge Arrow is a charge skill similar to Blade Flurry or Incinerate that has up to 5 stages, releasing it fires a piercing arrow that spawns a pod along its path for each stage, these pods then explode, firing projectiles all around it, each seperate pod can damage the same enemy on top of the initial arrow, making Scourge Arrow an absolute monster at single target with the overlapping damage all while being a great clear skill as well due to the range on the projectiles the pods spawn. While mapping I rarely charge up Scourge Arrow to maximum stages, 2-3 stages is usually enough to delete an entire pack, with the help of some Herald of Ice explosions of course. For Single target we utilize Point Blank and fully charge the skill, shotgunning all bosses off the face of the game. How did I decide on doing this build? The original inspiration for this build came from me trying to make a super fast clearspeed build that revolved around Hopeshredder, and also to optimally utilize the Zerphi's Heart I splurged on in Incursion League. Seeing as how Hopeshredder had that huge degen before the buffs and required Frenzy Charges, I decided on going Slayer/Raider Ascendant rather than a traditional Deadeye for this build when I theorycrafted it in Incursion, however this was about a month and a half in to the League, and I didn't have the interest to make another character that late in, so I shelved the build for the time being. So out comes 3.4 with huge buffs to Hopeshredder as well as a teaser video for Scourge Arrow, and being a huge fan of other charge-type skills such Blade Flurry and the newly reworked Incinerate, I decided I just had to make a build for it, and incorporated the skill into my Hopeshredder Incursion build. This is my original version of the build and I recommend that most players stick to this version. It's significantly cheaper and less complicated than version 2. This is in order of priority. If you do not have a 6link take out Hypothermia. Since we do so much cold damage even without much invested into our gear, we will have no problem chilling bosses for Hypothermia, giving us a huge more multiplier. Another option if you don't feel like you're chilling your enemies consistently enough is to simply use Added Cold Damage Support. For those doubting Damage on Full Life, we will always be outleeching the degen from Blood Rage and Hopeshredder, even though sometimes your health appears to be staying below its maximum, as long as you are outregenerating degeneration effects, Damage on Full Life will be enabled. The rest of the links are relatively self explanatory and are just simple damage multipliers. This is for mobility as well as topping off on Frenzy Charges against bosses. When moving between instances(which removes your charges as well as any leech you've built up) and I need some quick Frenzy charges, I will just use Frenzy rather than Ralakesh's Impatience to quickly reach my Frenzy Charge cap. From that point you shouldn't have to touch the skill again for the rest of the fight as your Raider Ascendancy should keep your Frenzy Charges up for the rest of the fight. Since we use Blood Rage this will proc the 50% increased recovery rate of life from Captured Queen of the Great Tangle due to Immortal Call momentarily stopping the degen from Blood Rage, increasing our Leech rate by 50%. If you have the extra socket, feel free to put in Increased Duration as well. Wrath is our highest DPS Aura and can be used with a Watcher's Eye that grants high crit chance, Blood Rage is also very important since it's our only way of generating a high amount of Frenzy Charges while mapping (since the Raider Ascendancy only grants them on hitting a Rare or Unique monster) and also grants a nice chunk of Attack Speed. The rest are just minor damage improvements and are somewhat optional, although I highly recommend at least using Herald of Ice for the clearspeed. - Weapon: Hopeshredder is the weapon that my entire build revolves around, we use it for its high flat cold damage as well as its high movement speed and leech. The bow synchronizes with the Slayer/Raider Scion perfectly since Slayer will counter the cold damage degen while Raider will maintain your Frenzy Charges against bosses. Hopeshredder is non-negotiable in this build. - Quiver: After a bit of revision to my build and some advice from Guffinn, I've decided that a rare quiver is overall better than Hyrri's Demise because of life since after switching back to Tombfist, I have much more flat elemental damage than before making the flat elemental damage from Hyrri's less needed. Hyrri's is still an amazing and cheap option but ultimately you should look for a quiver with Crit Multi, WED and life. - Helmet: Your helmet slot is a free slot in this build, I use Devoto's for the movement and attack speed as well as enchant availability on the market. - Body Armor: We don't need a second 6link for this build, making Kaom's Heart a no brainer for the massive life pool increase. - Gloves: Initially I used a pair of rare gloves with the "Socketed Skills gain 18% increased attack speed" affix, but the interaction this pair of gloves had with attack speed buffs like Blood Rage and Haste was removed in the recent patch (3.4.3c) so I've swapped back to a standard pair of 2 socket Tombfists as they are without a doubt the next best thing thanks to the innate Intimidation and Abyssal Sockets for more flat elemental damage. - Boots: I use a pair of 2socket Bubonic Trail boots simply for the movement speed and access to 2 Abyssal Jewels but like the helmet, this slot can be a wild card, feel free to use whatever you want. 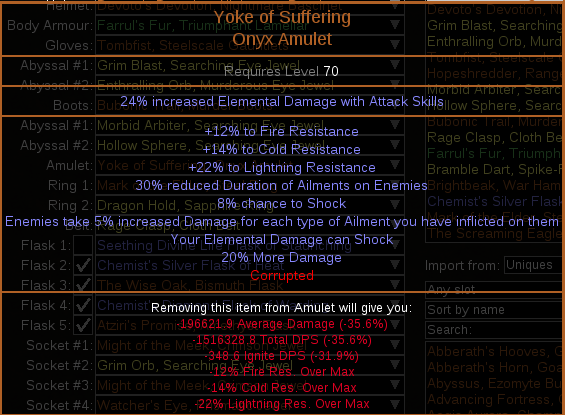 - Amulet: Yoke of Suffering is absolutely BiS for this build, since you do majority Cold Damage and also reliably apply 3 elemental ailments thanks to crit, this makes you apply huge Shocks via Cold Damage even to endgame bosses on top of another 15% more multiplier thanks to your ailments. Other decent options include The Pandemonius for Cold Penetration or Carnage Heart if you're on welfare. Although a bit out of order, I urge anyone reading this who hasn't read the DPS calculations at the bottom of the page to read that before reading this, that's how I calculate how much damage we get from the Shock that Yoke of Suffering provides. And now that that's out of the way, we know that against Shaper, Yoke will provide a total of 12% more damage via Shock in this build, also just for the purpose of this demonstration, I'll be using a Yoke of Suffering with 24% increased Elemental Damage with Attacks corrupted onto it, due to the fact that I currently have one and they only cost around 2ex, while the amulets I'm going to be comparing this to are mirror tier Shaper/Elder Rare amulets with perfectly Divined Quadra T1 Damage rolls, so I'd say the 2ex corruption I'm adding onto Yoke is pretty fair here. Remember that the time between the first shot of Scourge Arrow and the Thorn Pods exploding is shorter than our ailment duration of 1.4 seconds, meaning our Thorn Pods (which is most of our DPS) will ALWAYS benefit from Shocks applied by that initial Scourge Arrow shot, so a Shock of this caliber can always be reliably applied to our DPS. Note that these Amulets have FOUR T1 Damage rolls, and I added in the Cold Resistance so it remains our highest resist for Wise Oak. Amulets like this only exist in Standard for prices well over a mirror, and most likely won't give the same kind of resistances that Yoke of Suffering does. TL;DR of the comparisons? A Yoke of Suffering with a 2ex corruption offers the same or more DPS than standard mirror tier amulets for this build. "But whatabout life? 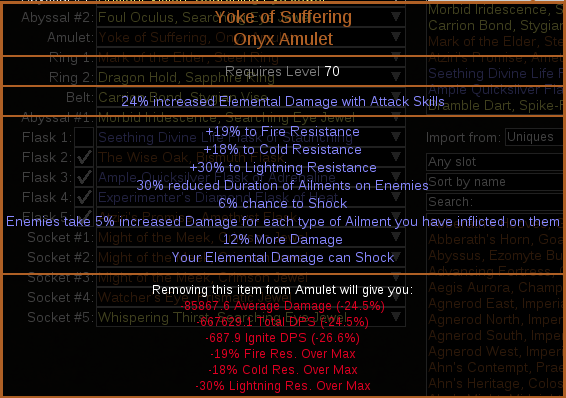 Yoke of Suffering can't get life"
This is true, but with the absurd amount of DPS this amulet provides for the build, it's far more worth it to sacrifice some damage nodes in our tree for Jewel sockets that provide life or simply just life nodes, and is far more efficient than buying a rare amulet with life on it. All in all there is NO REASON WHATSOEVER not to use Yoke of Suffering in this build other than it being too expensive at the start of a league, but especially when it's only 25c at the current point of the league, you should absolutely be running one. - Rings: Mark of the Elder is pretty standard for most attack-based builds these days, and this build is no different especially since Mark of the Elder adds a nice amount of flat Cold Damage which this build loves. Your other Ring should be any rare Shaper ring that fills out your elemental resistances, if you can get one with more flat elemental damage added onto it then more power to you. Both rings should be relatively inexpensive as well as hard to beat in terms of DPS, so I don't recommend anything else. My current ring has a level 21 Wrath corrupt on it since this build is pretty thirsty for gem sockets, but this isn't necessary. - Belt: Your belt is another free slot, use this slot mainly to fill out elemental resistances or get more life. If you have your resistances filled out by your other gear, feel free to use Darkness Enthroned with more flat ele Abyss Jewels for big deeps. 3x Might of the Meek around the Scion starting tree grants an absolutely insane amount of stats and should be one of your hugest gearing priorities, apart from that, Abyssal Jewels with flat Cold damage and life should fill up your other jewel slots. A Watcher's Eye that grants crit chance while affected by Wrath is also a nice touch. Other stat priorites on jewels include accuracy, attack speed (preferably attack speed if you've crit recently since they roll higher) and other flat elemental damages. - Starkonja's instead of Devoto's if you really want the extra pod helm enchant since both are cheap without the enchant (Devoto's Devotion with the Scourge Arrow Pod enchant is currently much more expensive than a Starkonja's with it). Other decent enchants include the simple increased Scourge Arrow damage enchant or Blood Rage attack speed. - Belly of the Beast instead of Kaoms, your chest slot should be used purely for defenses and Belly is a cheap option with a nice chunk of life, but if you really want a 6L and don't have it on your Hopeshredder, feel free to use a Tabula or a rare 6l chest with life. Loreweave is also another option for this build but those don't tend to be very budget friendly for most, especially earlier on in leagues. - One socket Tombfist instead of Two sockets will work perfectly fine as a budget option, or alternatively just a pair of generic rare gloves with life, resists and attack speed will work. - The Nomad is a really good option for a budget belt and I used one for most of my playthrough, it has pretty much everything you need aside from life and helps fill some of your strength requirements. A Ralakesh's Impatience to generate charges before a boss fight starts, I mainly only use these on Uber Elder and Shaper but it helps to make sure you're at full power before starting some of these bosses. If you're not familiar with how to use these boots, just equip them before a boss fight and don't move, when you're ready or the boss fight starts, reequip your normal boots before you start moving around and you'll keep all your charges. - Major God: Soul of Arakaali. We use this for the Queen of the Great Tangle effect, which can be acquired from Tier 6 Jungle Valley (updated as of patch 3.5). If you don't know what this does, it grants 50% increased life recovery rate if you've stopped taking a damage over time in the past 4 seconds, and yes this affects leech. We proc this by using Blood Rage and Cast when Damage Taken + Immortal Call, stopping the physical degen from Blood Rage will activate Queen of the Great Tangle. - Minor God: Personal preferance. I use Soul of Yugul for Varesh, causing you to take reduced Cold Damage if you've been hit recently which is a nice defensive boost against cold damage bosses like Elder. Slayer is the crux of this build when it comes to our skill tree and is absolutely required. Paired with Vaal Pact, the overleech will not only sustain us through the degen from Hopeshredder and Blood Rage, but will heal so fast that even some of the most brutal hits can be shrugged off completely, the innate Culling Strike from this Ascendancy is also nothing short of amazing for bossing. The Raider Ascendancy keeps our Frenzy Charges at maximum throughout boss fights while giving us Onslaught and movement speed, this makes us much faster while mapping and is a great boost to our dps. 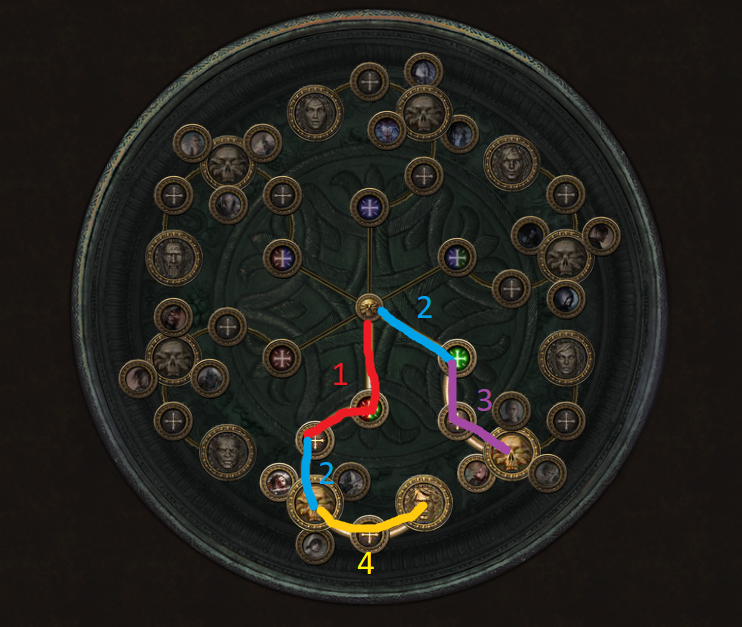 After the 3.5 nerfs to Quill Rain, I now recommend leveling with The Tempest/Storm Cloud and RoA instead of Toxic Rain, while still using the cookie-cutter Goldrim + Tabula setup. Your gem links should be Rain of Arrows -> Added Lightning Damage -> Added Cold Damage -> Mirage Archer -> Concentrated Effect -> Increased Critical Strikes. For early mapping just make sure your resistances are capped and you should be fine even without too large of a health pool thanks to your freezes and long range. Past that, mapping is smooth sailing to level 90 and beyond. - When going for raw single-target DPS, make sure to hold your cursor close to your character; this will shorten the spread between the pods that Scourge Arrow spawns, allowing for more thorn arrows to hit and benefit more from Point Blank. - Also for bossing, a good time to place down a Frost Bomb is right after you fire the initial arrow, this will apply the debuff before your thorn arrows explode and give you more burst damage. - When mapping just charge Scourge Arrow to 1-3 stages rather than fully charging, this should wipe most mob packs with ease while being much faster and smoother. - Try not charge up Scourge Arrow in close range to mob packs, even though we're pretty tanky and this usually isn't very fatal, this can result in us getting stunlocked without getting any damage off, either use your high movement speed to kite back if large packs get too close or Blink Arrow out. Now we're going to calculate and apply a very basic Shock but first I'm going to explain my logic here with Shock. Shock is an ailment that causes the enemy it's applied to to take up to 50% increased damage depending on how much damage you deal in a single hit (50% Shock is achieved by dealing 10% of your opponents maximum life in a single hit, it's a linear scaling meaning if you do 1% of your opponents maximum life you get a 5% increased damage Shock, and dealing 5% of your opponents maximum life nets you a 25% increased damage Shock and so on). Since the multiplier is applied to the enemy and not the player, it can be thought of as a More multiplier. Against trash mobs and even most random map bosses that have a low life pool, you're going to get the maximum Shock value since they're basically going to get 1-2shot by Scourge Arrow, so we're just going to focus on endgame bosses since that's where high DPS matters the most anyways. For our test dummy we use Shaper, since he has among the highest health in the game before factoring anything external such as map mods. For reference, the Shaper has 18,328,731 life (taken from the PoE Wiki). So now that we know that we can plug in 12% more overall damage into our DPS to calculate for Shock: 5,085,278 x 1.12 = 5,695,511 total DPS for our final calculation. One final thing to keep in mind is that since Yoke of Suffering reduces our Ailment Duration to 1.4 seconds, however the time it takes between firing Scourge Arrow and the Spore Pods exploding is slightly less than 1 second, meaning that if you apply the Shock from the initial arrow, the Spore Pods (which are the largest bulk of our damage) will always benefit from the Shock. This is the more finalized version of my build, all the basics of the build and the playstyle are more or less the same, just with several tweaks and gear differences that focus on improving the overall quality of life in this build. Keep in mind that this build is MUCH more expensive, costing me at least 50-60 ex more than the original version, if not more, which is why I still advise most players to stick with Version 1. The main difference here between this build and Version 1 that we swap out Mirage Archer for Ice Bite, the reason being that we will now be using Mirage Archer in our second 6link. This gives Scourge Arrow a significantly higher hit, allowing us to apply larger Shocks from our Yoke of Suffering, without losing the DPS from Mirage Archer. We are no longer using Kaom's in this version of the build which allows us to have another 6link setup. Rain of Arrows is by far the best option for a second skill due to the fact that it scales very similarly to Scourge Arrow in the sense that you don't scale additional projectiles with it like you do with almost every other bow skill, and does not require any gem swaps between mapping and bossing. This is an amazing addition to our clearspeed and bossing; simply firing Rain of Arrows every now and again ensures that the Mirage Archer stays above us, and with the huge AoE on the skill, even Mirage Archer alone does a great job at clearing mobs. Even if the Mirage Archer doesn't outright kill a pack, it will often chill and freeze them, lowering the amount of threats to you. Another huge bonus we get is Vaal Rain of Arrows, which deals much more damage than it seems while applying a hefty maim on enemies (yes even endgame bosses). If you have uses of this skill upon entering a boss room, use both charges on top of all your other skills and watch as even the tankiest guardians get deleted almost immediately. No changes here. We use this to proc Arachnoxia and increase our leech. As a nice bonus our Immortal Call now lasts longer since we use Endurance Charges now. Again, no changes here, but I do want to make it a point that it's very important to get Wrath as a corruption in our ring since we don't have a single gem socket to spare and we don't want to have to meet intelligence requirements. Having the skill come from a corruption rather than a gem allows us to have a level 21 Wrath and completely bypass the Intelligence requirement. - Weapon: Hopeshredder is still as much, if not more core to the build. Now that we use Farrul's Fur with Aspect of the Cat, we are permanently at maximum Frenzy Charges, and no weapon loves Frenzy Charges as much as Hopeshredder. - Quiver: While Hyrri's Demise was a great option in Version 1, a rare quiver with life and resists is now much more important due to the loss of life from dropping Kaom's, as well as the fact that it's going to be a little harder to get resists from our belt (more on that later). While a rare quiver was optional in Version 1, it's now essential for Version 2. I'm not going to go over every individual armor piece again as everything but the chest piece is exactly the same, but I will talk about our shiny new armor a little bit. Note that there is something a little bit annoying about this setup though, and that's that since Hopeshredder has the cold damage degen per Frenzy charge, and you now always have Frenzy charges, this means you will degen in even in your hideout, but this is very minor and easily fixed by just swapping to your secondary weapons. If you haven't yet read the DPS calculations for this build, I strongly recommend you go there first at the bottom of this guide so you can see how I've calculated the Shock multiplier into the build. I compared this to standard mirror tier amulets in my original build, but with Yoke providing a whopping 35% of our damage in this build, it's safe to say that absolutely nothing in the game will beat this amulet for our build. All in all Yoke just isn't optional for this build, it simply brings way too much to the table to pass up. - Belt: This is how we get Aspect of the Cat. I decided that the belt slot was the best piece of our gear to get this on due to the fact that it was the least essential part of the build. Note that these are pretty rare in the current league as they only come from Delves, so finding a belt with decent rolls is very hard. Prioritize a belt with life and at least 1 sizeable resist. Aspect of the cat is a great DPS boost and is now essential to maintain Frenzy Charges due to Farrul's Fur. Since Aspect of the Cat gear with strong stats is pretty hard to come by currently, I've decided to make up for the lack of resists in our quiver, which is why I stressed the importance of now having a rare quiver instead of Hyrri's. If using up your belt slot for Aspect of the Cat isn't something you want to do (most likely for Headhunter) I recommend trying to get Aspect of the Cat from the Farrul's Bite helmet instead since it's actually a pretty nice damage upgrade to this build at the cost of the movement speed from Devoto's, but I'll add that doing this will make the Scourge Arrow enchant a huge pain to acquire. - Ring: Although my Mark of the Elder remains unchanged from version 1, I want to stress how important it is that you get the "Grants level 21 Wrath Skill" in version 2. We don't want to be wasting gear affixes and skill points to meet intelligence requirements and we don't have a single gem socket to spare as every socket we use is essential, and having this corruption allows us to completely bypass the Intelligence requirement of Wrath. If you just REALLY can't get this ring corruption (since it's become pretty expensive on the market) then the closest you can do is get a Shaper ring with Herald of Ice as an affix on it then use a lower level Wrath in a gem socket since you'll be able to drop Herald of Ice in your gem sockets. This is where I've made the most changes in my gear, not only do I have 2 more jewel sockets, but my jewels also now have a higher priority on life to make up for Kaom's Heart. Whereas before, this build could afford to have some pure DPS jewels, this is no longer the case which causes our jewels to be much more expensive. Make sure your jewels have a decent life roll on them (absolute minimum 35 life) and 2 decent damage mods. Prioritize stats like flat cold damage, attack speed if you've crit recently, and critical strike multiplier. The main difference here is we now always run an Onslaught flask due to losing it from dropping raider so we can keep up on attack and movement speed, and we don't run Wise Oak while mapping. When bossing I like to swap out my Wise Oak for my Quicksilver flask for the penetration but this is optional. - Major God: Soul of Arakaali. No changes here either. Soul of Arakaali is by far the best major god due to Arachnoxia increasing our life recovery rate by a whopping 50% when we proc Immortal Call. - Minor God: It's still mostly up to personal preference but I find myself often using Soul of Garukhan for the evasion boost and the extra movement speed since this version of the build has slightly lower movement speed overall. Vaal Pact - Still absolutely core and non-negotiable in this build. Thanks to Slayer overleech this is our main form of sustain and keeps us almost always at full HP. Point Blank - up to 50% more damage in close range, another non-negotiable node as this synchronizes perfectly with the overlapping damage of Scourge Arrow's pods. It is one of our hugest DPS upgrades for just 1 point. 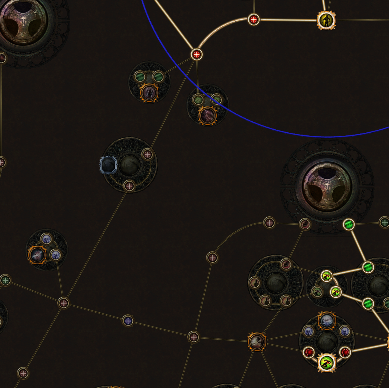 Acrobatics - the only somewhat optional Keystone node in this build, but still STRONGLY recommended as it only costs 1 point in our skill tree and is a huge defense boost. Phase Acrobatics is still a nice option as well if you're willing to sacrifice a bit of life and/or damage here and there. Slayer is still the absolute core of this build when it comes to Ascendancy, a huge amount of our survivability is thanks to the overleech from Slayer. This is arguably the hugest difference in our overall skill tree for this build. We no longer need Raider since we have permanent Frenzy Charges from Farrul's Fur, which lets us explore other Ascendancy options. I've chosen Juggernaut as it gives this build a huge amount of both survivability and damage, being immune to stuns and chills lets us play more upfront due to the fact that it's near impossible to interrupt Scourge Arrow now, and is absolutely amazing for general survivability. On top of this we get a MASSIVE 1000 accuracy which is incredible for damage consistency, it isn't hard to hit the accuracy cap with this much additional accuracy and my current build has 94% hit chance. Last but not least we get free Endurance charge generation, which is great for physical damage reduction, especially since it drastically increases the duration of Immortal Call. I'm just going to post my level 95 skill tree since most of this stuff is pretty similar to my first guide, but I will go over the differences. I'm going to go over all the details here just to make sure nobody misses anything. There's only a couple tips & tricks here that differentiate from the original build but they're definitely worth noting down in any case. - A great time to fire Rain of Arrows is right after you fire Scourge Arrow; the animation transitions very smoothly and can lead to a bit of extra burst damage. - If you have Vaal souls, firing off both charges of Vaal Rain of Arrows at the very start of a boss fight will chunk it extremely hard and slow them immensely thanks to the maim, and apart from bosses with multiple phases or perhaps guardians with very tanky rolls, the maim lasts long enough for you to kill them outright, which turns most boss fights into absolute cakewalks. Again, I'll be using the PoB for the second version of my build for these calculations. We don't use Mirage Archer in this version of the build so we don't need to calculate for that. I'm going to save some space here and skip the brief explanation on how Shock works, if you're uncertain about it, I quickly explained it in the DPS calculations for the original version of the build. Again, for our test dummy we use Shaper, since he has among the highest health in the game before factoring anything external such as map mods. For reference, the Shaper has 18,328,731 life (taken from the PoE Wiki). So now that we know that we can plug in 20% more overall damage into our DPS to calculate for Shock: 5,680,911 x 1.2 = 6,817,039 total DPS for our final calculation. - 358,094 damage per arrow, calculating the Shock from Scourge arrow in we get (358,094 x 1.2 = 429,712 DPS) per arrow. Hi, I have a question about how it is compared with fire ele hit? is better? Looks really strong, will be interesting to see how it performs in deep delves - might be worth switching in some more defensive jewels (blind, phasing, etc) later on. Do you feel the Scion movespeed is a necessary 3 points to take? I'm quite happy with the move speed without it and was thinking of taking Cloth and Chain (with 1 point spare) or Survivalist to make it easier to cap resistances. Hey, can you explain me the math behind "5.9kk shaper dps"? POB has 3.9kk DPS with "Normal mobs (not shaper)" setting and 'shocked' ticked, that applies 50% shock. Wow, thats a really nice analysation. thanks for this. Fire ele hit tends to be much tankier (8-10k life) but overall deals less damage. No it is not necessary to take at all, if you want to use the points for anything else that's perfectly fine. With "Shaper/Guardian" ticked on in PoB the main arrow deals 1,259,344 DPS, and the the thorn arrows deal half of that each and there's 5 of them which equals out to 3,147,770 DPS for thorn arrows in PoB. Note that we're not counting the additional pod helmet enchant at the moment which would bring the thorn arrow DPS up to 3,777,422. Finally I added the two values together (4,407,114 + 1,568,932 = 5,967,046 DPS) and that's how I did my DPS calculations. Hopefully this clears this up a little bit.